a couple weeks ago i shared a recipe for a cherry + peach galette. it was beautiful. it smelled like heaven. it was so warm and sweet and the crust was so flaky. but i was lying to myself. the chef has a sweet tooth like you wouldn’t believe: he’ll eat a whole pan of brownies in one sitting. but savory is more my style. i even carry salt on my keychain. and i love what galettes look like, with the folded over, pleated crust. i knew it had to become a staple in our kitchen. there are so many ways you can fill it, making it a staple has been très facile. 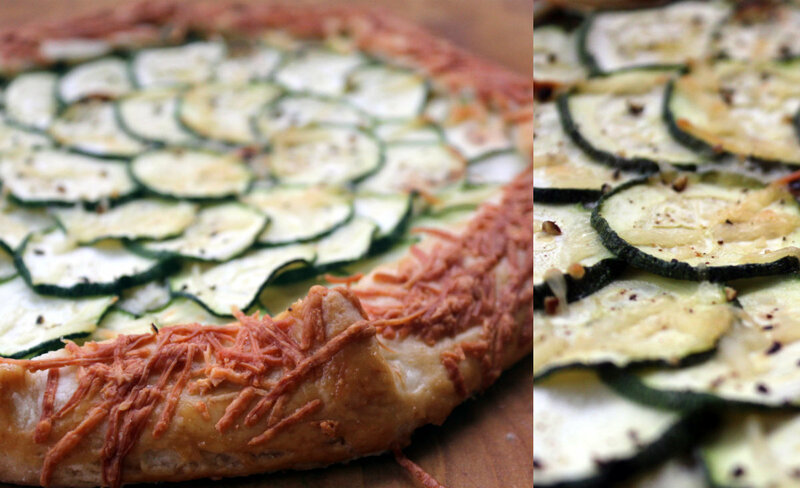 the latest incarnation: this savory three cheese and zucchini galette. the dough is the tried and true, martha stewart’s favorite pie crust recipe. the only thing you need for that is flour, butter and water. 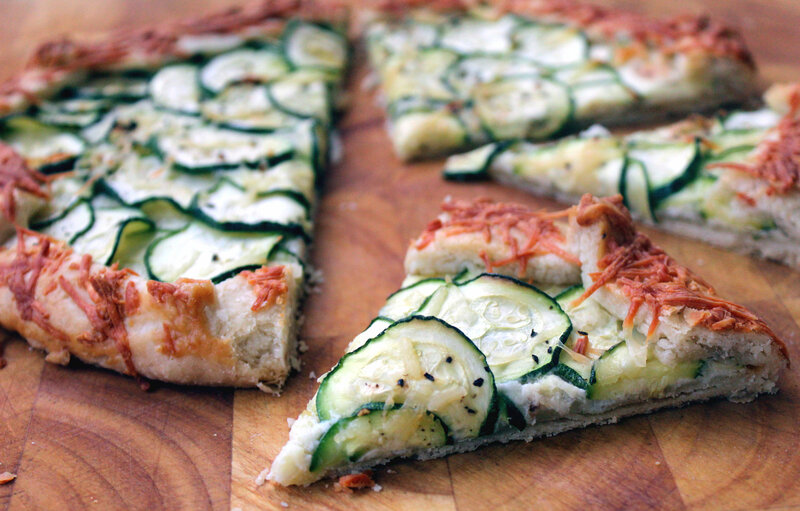 mastering this crust recipe will totally change your cooking game. it works for savory or sweet, and always finishes golden and flaky. 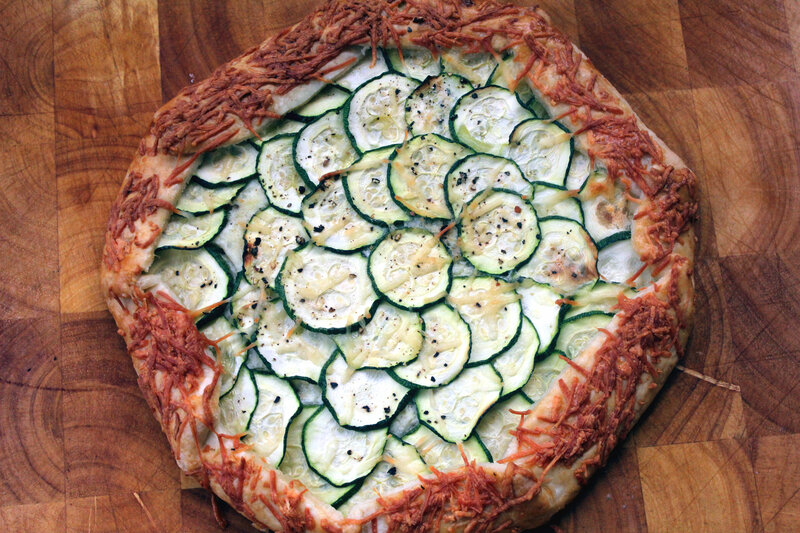 while the dough is cooling in the refrigerator, slice the zucchini about as thick as a nickel, then spread the discs out on paper towels without overlapping. sprinkle with salt and cover with another paper towel. this gets any extra liquid out, otherwise when you bake the galette, it will be soggy. while zuchinni rests, throw the cheeses and the olive oil in a bowl and mix with your hands. add more olive oil as needed until the mixture is easily spreadable. add salt and pepper to taste. roll the dough until its about 1/8 inch thick and cut into a circle. to make a big, perfect circle, i turn my largest mixing bowl upside down on the dough and using a pasta cutter or a sharp knife, cut around it. dump the cheese mixture in the middle of the dough and spread out, using hands, except for a 2 inch border around outside of dough. starting on the outside of the cheese mixture, lay zucchini slices, overlapping. fold 2 inch dough border over, pleating where necessary. beat an egg in a bowl, and brush over crust. top with extra parmesan, for desired effect. bake for 45 minutes, on an oil sprayed silpat, preferably. if you don’t have a silpat (get one! ), you can spray parchment paper, or just use a nonstick cookie pan. side note: getting it on and off the silpat is a little tricky. to get it on, i lift with a spatula with my left hand, then slip my right hand under and quickly transport to the pan. getting the galette off is a lot easier if you let it thoroughly cool before trying. sometimes, i use two spatulas, like some kind of ridiculous looking person. if you have a better idea, please let me know. ha! note to self: don’t take pictures of brown food on a brown cutting board. duh. those instructions might look long, but i think it’s just because i talk write too much. this is a really simple thing to do. it shouldn’t take you more than an hour, from when you start the dough to when you pop it in the oven. i know most dough recipes say to leave in the refrigerator for an hour before use… that’s so it will be easier to roll out, not so soft. but for me, an hour is too long. maybe my refrigerator is too cold, or maybe i’m weak, but dough left in for an hour might as well be a rock to me. 20 minutes is my happy place. i’m looking forward to trying this recipe a million different ways. i’m already hungry again.